Quilting Adventures: What's going on.....! What a busy week it's been! I haven't been home all week. Darn.... when will it slow down a bit? Since school has been out, there were 2 things I wanted to work on, EQ6 and more play dates with Penelope. Well, tonight I did both! They are not perfect but at least I'm getting some practice time. In my MQX classes with Dawn Cavanaugh, we learned different ways to do a feather. So, I've been practicing all of them. For me, some techniques are much easier than others. 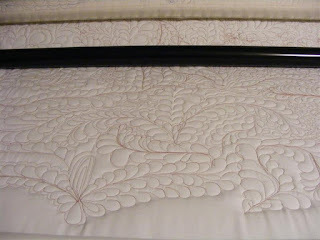 I would really like to be able to create those gorgeous feather designs that you see on quilts. Anyway, the more I practice, the better I'll get! The weather here hasn't been that great, so my new bike has been sitting in the garage. I was going to take it to the shop today but the wind was unbelievable. Besides, I am so tired, just looking at the wind took any ounce of motivation I had. I have always loved feathers too. I wish that I was better at them. There really never seems to be enough time these days. I think we can all relate. That's was the hardest thing for me to grasp....I could do anything if I would just practice, practice and practice some more! I would get frustrated if I couldn't do something perfect the first time, instead of being happy that I improve from the beginning of a quilt to the end. I need to do that, too... practice, practice, practice. Thanks for the inspiration!! Yours look great, by the way! They look fabulous! How's the shop coming along? The feathers are coming along great. How's it going at the shop? So you finally came out of the Lakeside Coffee Shop. I've been here patiently waiting for you. The feathers look great to me! I think it just looks great. I wanna machine too! Oh, MAN! I just got a new quilting machine...so much to learn. You have done beautiful work. Just stopping by to say a quick hi. Hope the shop is going well. Your feathers are looking awesome...great job!